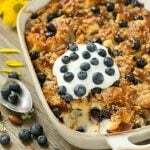 This recipe for blueberry bread pudding has a streusel topping and is finished off with a drizzle of salted caramel. The ultimate comfort food! Bread pudding is a time honored dessert, but when you load it up with fresh blueberries it really elevates this dish to the next level. This post is sponsored by Blue Diamond Almonds. Thank you for supporting the brands that make Dinner at the Zoo possible! We have this restaurant in our town where the food is good but the desserts are even better. The owner gets up at the crack of dawn and churns out about ten different dessert options every day. Each time I go there a seasonal bread pudding is on the menu – last time it was a blueberry bread pudding and I’ve been wanting to recreate it at home ever since. I think I did pretty well with this blueberry almond bread pudding, everyone loved it and it might even be better than the restaurant version! 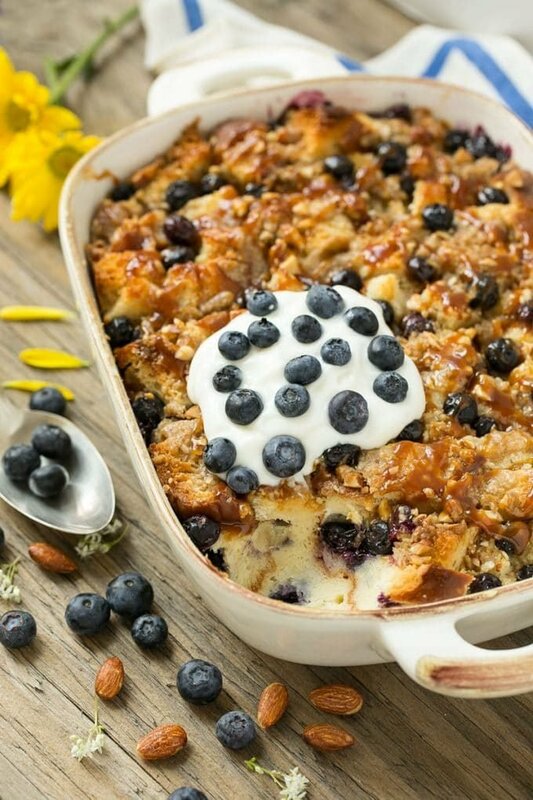 How do you make blueberry bread pudding? I used a challah (egg bread) for this pudding. Most stores sell some type of challah or other egg bread, you could also use brioche or a french bread. I layered bread cubes with fresh blueberries and almonds and poured the custard mixture over the top. I wanted to add a little texture so I created a streusel to sprinkle over the top and added some chopped almonds. I couldn’t stop there – yes, the streusel adds something special but I also felt like a sauce was in order. I went with salted caramel to complement the almonds and that was an excellent choice! If you want to take it even further you can add a dollop of whipped cream and some fresh berries, and all of a sudden a humble blueberry bread pudding dessert becomes something spectacular. This is a great make-ahead dessert; you can bake the pudding a day in advance and add the salted caramel sauce right before you serve it. If somehow you have leftovers you can even serve it as a decadent breakfast the next day – I won’t judge you! 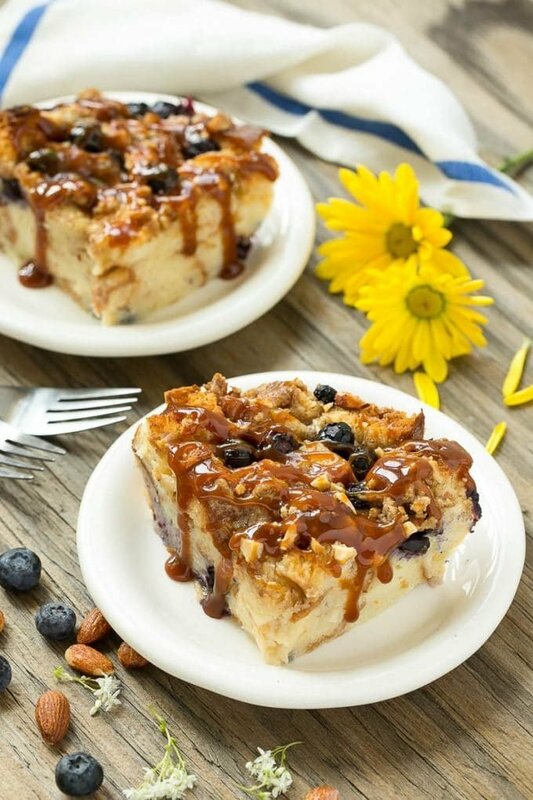 Either way, this blueberry bread pudding is sure to please any crowd. 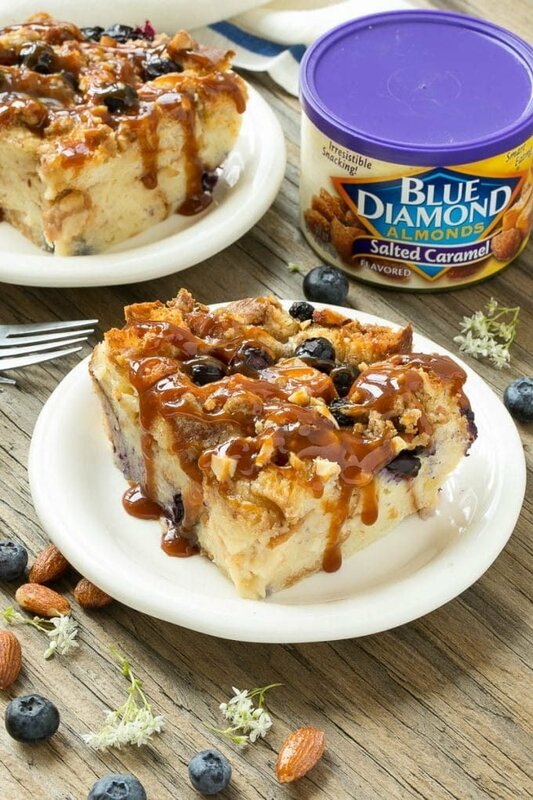 This blueberry bread pudding has a streusel topping and is finished off with a drizzle of salted caramel. The ultimate comfort food! Preheat the oven to 350 degrees. Coat a 9 inch square pan with cooking spray. In the pan, place 1/3 of the bread cubes in a single layer. Add half of the blueberries and almonds. Top with another 1/3 of the bread cubes. Add the remaining blueberries and almonds. Top with the remaining bread cubes. In a medium bowl, whisk together the eggs, milk, sugar and vanilla until thoroughly combined. Pour over the bread and blueberry mixture; make sure the bread is completely covered by the custard. To make the streusel, mix together the flour and brown sugar in a medium bowl. Cut the butter into the flour and sugar with two forks or a pastry blender until coarse, pebble sized crumbs form. Stir in the almonds. Sprinkle the streusel evenly over the bread pudding. Bake for 40 minutes or until bread pudding is golden brown and cooked through. Remove from oven and cool for at least 30 minutes. Drizzle salted caramel over the top and serve with whipped cream and extra blueberries if desired. Make Ahead: The bread pudding can be made a day in advance, add the salted caramel sauce just before serving. New favorite bread pudding! I made this blueberry bread pudding and it was so good! I threw in some raspberries too! Now this is a bread pudding!!! I just want to pour that salted caramel on everything! 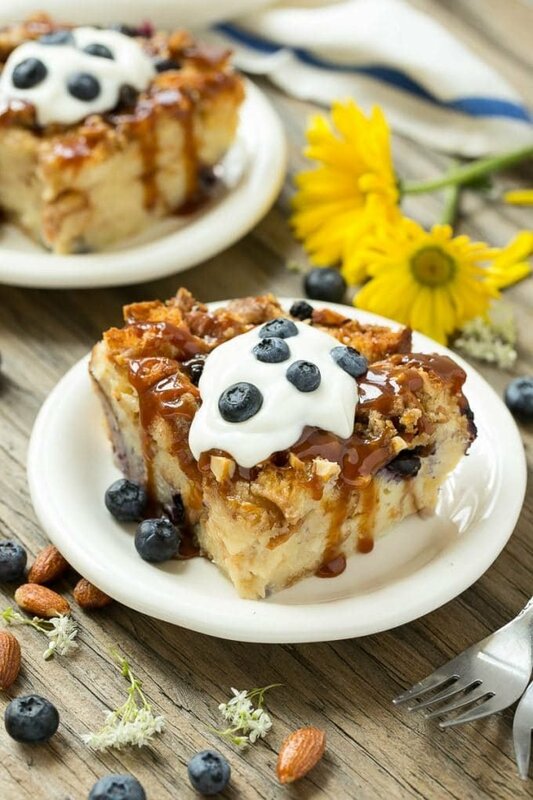 Including this blueberry almond bread pudding. It looks gorgeous and absolutely delish!